The Best Funny Youtube Channels from thousands of top Funny Youtube Channels in our index using search and social metrics. Data will be refreshed once a week. California, United States About Blog Smosh is absolutely the best place to funny videos. Bringing you Smoshy Goodness since 2005! Facebook fans 6,940,276. Twitter followers 3,321,079. NYC About Blog Original and funny videos from CollegeHumor.com, one of the most popular comedy sites on the web. Enjoy CH's award-winning sketches, animations, music videos and web series, delivered right to your (digital) doorstep--like the paper! Or drugs! Facebook fans 8,335,920. Twitter followers 1,026,835. Facebook fans 3,153,856. Twitter followers 5,786,510. Hollywood, Ca About Blog Funny videos, funny pictures, and funny articles featuring celebrities, comedians, and you. Will Ferrell is our boss. We love to make you laugh. Facebook fans 15,224,282. Twitter followers 14,376,824. Facebook fans 5,120,151. Twitter followers 24,749. Facebook fans 24,776,805. Twitter followers 565,043. United States About Blog Well hello there! We are the Eh Bee Family. We post a variety of crazy family fun videos about 3 to 5 times a week! Facebook fans 11,438,020. Twitter followers 115,073.
http://www.mrbean.com/contact About Blog Welcome to the Official Mr Bean channel. Facebook fans 77,359,276. Twitter followers 103,847. Facebook fans 1,159,547. Twitter followers 1,410,769. United States About Blog Comedy Central brings you the funniest stuff on the planet. Watch hit shows like Workaholics, Tosh.0, The Daily Show with Trevor Noah, Inside Amy Schumer, Key & Peele, @midnight and Broad City, plus cutting-edge stand-up comedy you won't find anywhere else. Facebook fans 6,399,537. Twitter followers 1,567,742. Las Vegas, Nevada, United States About Blog Ryan Higa is best known for his comedic video vlogs and short films, which average approximately 10.7 million views per video, making him one of the most successful partners on the YouTube platform. His “Nice Guys” video has more than 71.8 million views. Facebook fans 2,126,962. Twitter followers 2,148,596. About Blog The Tonight Show Starring Jimmy Fallon features hilarious highlights from the show including: comedy sketches, music parodies, celebrity interviews, ridiculous games, and, of course, Jimmy's Thank You Notes and hashtags! You'll also find behind the scenes videos and other great web exclusives. Facebook fans 13,235,131. Twitter followers 3,994,697. United Kingdom About Blog PRANKS! PRANKS! and more....SORRY BRO!! Subscribe to my channel and join my ARMY! I'm Ben Phillips, Pranking my broElliot Giles my mission is to make the world SMILE! Facebook fans 9,759,539. Twitter followers 610,437. San Francisco, CA About Blog Welcome to /r/FunniestVideos! This subreddit is the place to post and to find the funniest videos on the internetz. Facebook fans 1,175,374. Twitter followers 534,445. London, England About Blog Hello i'm dan i make videos about how awkward i am and people laugh at me. Facebook fans 1,211,817. Twitter followers 7,681,639. Brighton, England, United Kingdom About Blog PewDiePie a Swedish web-based comedian and video producer. I make videos. Facebook fans 7,411,602. Twitter followers 14,576,079. Facebook fans 1,810,420. Twitter followers 187,845. Hollywood, CA About Blog JukinVideo is the leading viral video community channel dedicated to showcasing the hottest UGC videos from across the web. We love videos and find the best ones to share with you here, from fail videos to ice bucket challenges, and soccer tricks to a baby reacting to Katy Perry's Dark Horse. Facebook fans 8,840,463. Twitter followers 12,786. Facebook fans 5,387,908. Twitter followers 50,236. California About Blog Gabriel "Fluffy" Iglesias' style of comedy is a mixture of story telling with characters and sound effects that bring all his personal issues to life. His amazing ability to cross over with a clean animated style of comedy has put him in big demand throughout the stand-up comedy circuit. Ask anyone who has seen him in concert and you will probably hear the same thing, "He was so funny!" Facebook fans 9,138,840. Twitter followers 1,024,709. Los Angeles, CA About Blog We make comedy videos. Facebook fans 467,975. Twitter followers 1,709,755. Venice Beach, Brooklyn, California, New York, US About Blog Crazy Pranks. Pranking Couple. Public Prank. Facebook fans 1,363,088. Twitter followers 1,464,721. Facebook fans 304,080. Twitter followers 19,206. London, UK About Blog The Wall Of Comedy is a Brand New home of UK comedy and Entertainment, founded by Mandem On The Wall . Facebook fans 4,434,502. Twitter followers 22,531. Facebook fans 194,706. Twitter followers 2,831. Montreal, Quebec About Blog We put kids in the driver's seat by letting them play funny pranks on unsuspecting adults. Tune in every Wednesday and Saturday for brand new prank videos! Facebook fans 293,616. Twitter followers 1,877. USA About Blog Sunnny Skyz is a website for everything happy. Good news, feel good stories, inspirational short stories, happy pictures, videos and more! Facebook fans 322,090. Twitter followers 1,250. Facebook fans 428,168. Twitter followers 24,874. India About Blog The one stop shop for all things Indian. Presenting to you India at its quirkiest best. Subscribe for your daily dose of humor and much more. Being Indian - The fastest growing Indian YouTube channel in India. Facebook fans 7,519,920. Twitter followers 86,690. Chicago, IL About Blog The ONLY Official Youtube channel for the Nostalgia Critic and Channel Awesome. Facebook fans 32,197. Twitter followers 66,860. About Blog Above Average is home to the Internet's top entertainers, celebrities, writers and comedians. We create premium comedy series such as "7 Minutes in Heaven," "Alec Baldwin's Love Ride," and "Live @ The Apt." Our weekly variety series "Above Average Presents” includes videos such as "Everyone's Upstairs Neighbors" and "The Real Reason Your Food Takes So Long." Facebook fans 1,393,687. Twitter followers 42,240. Austin, Texas About Blog Welcome to the Rooster Teeth Channel. We're a production company in Austin, TX, making live-action shorts and series, podcasts, and animated comedy. Facebook fans 1,029,090. Twitter followers 1,010,542. About Blog Dudes Trying to Make You Laugh. Youtubers, Pranksters, Love Music and Dance. Facebook fans 993,915. Twitter followers 1,841. Facebook fans n/a. Twitter followers 1,286,984. Los Angeles, CA About Blog Just a little brown girl with big dreams. This has been my bio for years.. i'm stuck with it. New videos every Wednezzzday with Lizzza! Facebook fans n/a. Twitter followers 1,755,518. United States About Blog YesFunnyYes is the #1 place where you will find the funniest pranks, compilations, and comedy all in one place. Now you can spend more time laughing and less time searching. Facebook fans 135,129. Twitter followers 151,781. India About Blog Shuttling between Bombay and Bangalore, I am a stage performer along with a reclusive creator of digital content. Stand Up Comedian, Musician and Filmmaker. Facebook fans 485,652. Twitter followers 1,552,120. Mumbai, India About Blog SnG Comedy are a group of professional stand up, improv and sketch comedians from Mumbai, India. Facebook fans 475,467. Twitter followers 272,833. About Blog Sketches, Stand up, News comedy. That's it, really! A bunch of silly comedians just putting stuff up that we find funny, even if others don't. Facebook fans 986,559. Twitter followers 1,308,167. About Blog Abish Mathew is an Indian Stand Up comedian, actor and musician. Facebook fans 747,213. Twitter followers 1,296,317. About Blog I'm Nathan Zed. I type, as I sit at my laptop, the rest of my body completely motionless.The click-clack sound of the keyboard echoing in my ears long after I had finished typing. I remain still for what seems like an eternity, only moving to wipe the single tear streaming from my right eye. "Not like this...", I let the whisper escape my lips loud enough for anyone nearby to hear me. Facebook fans n/a. Twitter followers 494,745. About Blog Motivational speaker, author, Halloween enthusiast, math nerd. Facebook fans 374,844. Twitter followers 35,520. United States About Blog Funny VIdeos! Facebook fans n/a. Twitter followers 257,844. About Blog FUNnel Vision is a family of 6 with 4 kids Lexi, Michael, Chase & the baby brother Shawn!We like to say HAVE A FUNnel Day, like Fun 'Ol Day 'cause that's what we do on this channel! We Post New videos every week! Facebook fans 57,572. Twitter followers n/a. About Blog Welcome to All4tubekids. This is a fun place for parents and children to see a part of our lives through our reality videos and skits and interact. All kids and parents are welcomed to watch our videos and share their thoughts, ideas. We post family reality videos, family safe pranks, kids funny comedy videos, skits, and kids challenges. Facebook fans 14,180. Twitter followers n/a. Chicago, IL About Blog Every week watch new funny video sketches and series from The Second City, the famous Chicago, Toronto and Hollywood based comedy theatre and school of improv. Facebook fans 156,803. Twitter followers 62,168. Los Angeles About Blog Welcome to Markiplier! Here you'll find some hilarious gaming videos, original comedy sketches, animated parodies, and other bits of entertainment! Facebook fans 3,219,586. Twitter followers 10,530,680. Canada About Blog CBC Comedy is your destination for funny Canadian web series, stand-up comedy, and sketches and clips from television shows from the CBC, Canada's national broadcaster. Facebook fans 165,484. Twitter followers 5,129. Los Angeles About Blog NEW VIDEOS THURSDAY- SUNDAY!!! COME CHECK IT OUT! Facebook fans 192,350. Twitter followers 139,326. London About Blog Comedy Sketches, virals and other funny stuff from The Exploding Heads. Facebook fans 2,670. Twitter followers 404. San Luis Obispo, California About Blog The BEST in original pranks, how to's, public pranks, social experiments, comedy, magic tricks and funny videos presented by world-famous Magician Rich Ferguson. Facebook fans 61,167. Twitter followers 2,679. Los Angeles, CA About Blog Mike Falzone has been solving the internet’s problems since 2006 when he became one of the first creators to establish themselves on YouTube. He’s performed at College Humor Live, several of the Improv comedy venues, and has appeared on-stage at the world famous Comedy Store. Facebook fans 18,547. Twitter followers 54,032. India About Blog Warangal Diaries Bringing You The Hilarious & Funny Short Comedy Skits , Public Videos , Prank Videos , Social Experiments , Inspirational & Motivational Videos And Much More!! We Will Make You Laugh & We Will Win Your Hearts. Facebook fans 14,846. Twitter followers 274. Facebook fans 5,332. Twitter followers 154. India About Blog We upload the most interesting and funny videos on YouTube. Subscribe to get the ultimate entertainment. Facebook fans 1,483. Twitter followers n/a. Facebook fans 14,705,752. Twitter followers 82,512. United States About Blog Great funny videos for kids and adults! Plus, every time someone subscribes, a litter of kittens are born! Facebook fans 2,159. Twitter followers 109. Bangladesh About Blog Hello every body, Welcome to our channel. This is a funny videos channel and We are always trying to provide the best quality funny videos, funny fails, comedy videos. We have some funny type friends, they all time make some fun acting as real or fake. Facebook fans 954. Twitter followers 97. Albania About Blog Thanks for visiting the Vine Age YouTube channel and welcome to the world of Fun. Now you can have the best funniest Video all in one Channel. Los Angeles, CA About Blog Hey, my name is BigNik and I post funny vlogs every Thursday and Sunday! You can expect all crazy things such as skits, challenges, and even public disturbances! Hope you guys enjoy these vlogs. Canada About Blog Your #1 Source for Funny Gaming Videos across the Community! We provide you with entertaining daily content that gives you the chance to explore new videos and find new channels. United States About Blog Fails, Fails, Fails. New Fail Compilations every week! About Blog New funny videos and pranks every week. Mumbai, India About Blog TVF-ONE is India's first and biggest Organized OnlineTV, where you can watch regular shows and content, created especially for the young audience, across genres like Humor/Drama/Trends etc. Facebook fans 3,242,342. Twitter followers 1,637,215. United States About Blog "Funny Vine Videos | FVV" brings to you the best funny compilation on YouTube including : Try Not To Laugh Challenges, The Best Try Not To Laugh Challenges, IF YOU LAUGH YOU LOSE Challenges, Dank Memes Vine Compilation, SAVAGE LEVEL Compilations & More Funny Videos. India About Blog Amit Tandon is a Stand up Comedian from India, trying to tell some stories and make some observations. Loves to perform live shows across the globe. About Blog Hi there! We create all kinds of funny compilations, mostly about vines, funny animals, funny fails and other videos..
Australia About Blog The best Vine Compilations channel on Youtube ! We are bringing you the Best and Newest VINE compilations. Facebook fans 226. Twitter followers 87. Brazil About Blog Funny videos list for you die laughing, are posted daily. About Blog Welcome to OOOPS channel where you'll find nothing but funny videos and funny pranks! About Blog Best Funny Jokes Videos - Best jokes from all over the Web! At "Best Funny Jokes Videos" we provide the funniest videos all in one place. Now you can spend more time laughing and less time searching. About Blog We make funny videos to avoid getting a proper job. Facebook fans n/a. Twitter followers 312,901. Mumbai, Maharashtra and Delhi About Blog Zakir shares his comic perspective on daily life struggles which leaves the audience wondering if they are laughing at him or themselves. Facebook fans 563,733. Twitter followers 373,279. Florida, USA About Blog Welcome to the Dream TEAM! Just trying to make people Smile and Laugh!! New Video Every other day!! Facebook fans 5,116. Twitter followers 1,588. About Blog We create all kinds of compilations, mostly about animals, lego animations, lego tutorials and other videos. Here you will find the best and funniest animal videos, pictures and shows! Facebook fans 2,795. Twitter followers n/a. India About Blog I am Biswa and I am a stand up comedian. This is my stand up comedy channel. Nigeria About Blog Mark Angel Comedy is a platform where people can watch funny videos. We bring you a new video every Friday. Facebook fans 4,018,350. Twitter followers 45,429. United States About Blog Welcome to Funny Pet Videos, a channel dedicated to cute, fluffy cats and curious, rambunctious dogs. We are here to fill your life with more furry and funny things the adorable friends in our lives do. Every Thursday, Friday, Saturday and Sunday we'll have a new compilation of the funniest home videos of cats, dogs, birds and all kids of animals being equally hilarious and adorable. Facebook fans 50,232. Twitter followers 20,013. United States About Blog Funny videos, epic laughs. We collect the best fails, funny pets and hilarious moments to give you a good laugh. Sit back and enjoy! Facebook fans 942. Twitter followers n/a. Atlanta GA About Blog Guaranteed to make you laugh or not laugh, at least twice...guaranteed. Facebook fans 27,394. Twitter followers 11,943. Australia About Blog Hi! I'm Natalie and I've been making videos online for far too long. They're (hopefully) fun videos that are a combination of monologue and sketches that focus on the humourous aspects of everyday life. Facebook fans 347,462. Twitter followers 269,170. About Blog Comedy is a genre of film in which the main emphasis is on humor. These films are designed to make the audience laugh through amusement and most often work by exaggerating characteristics for humorous effect. 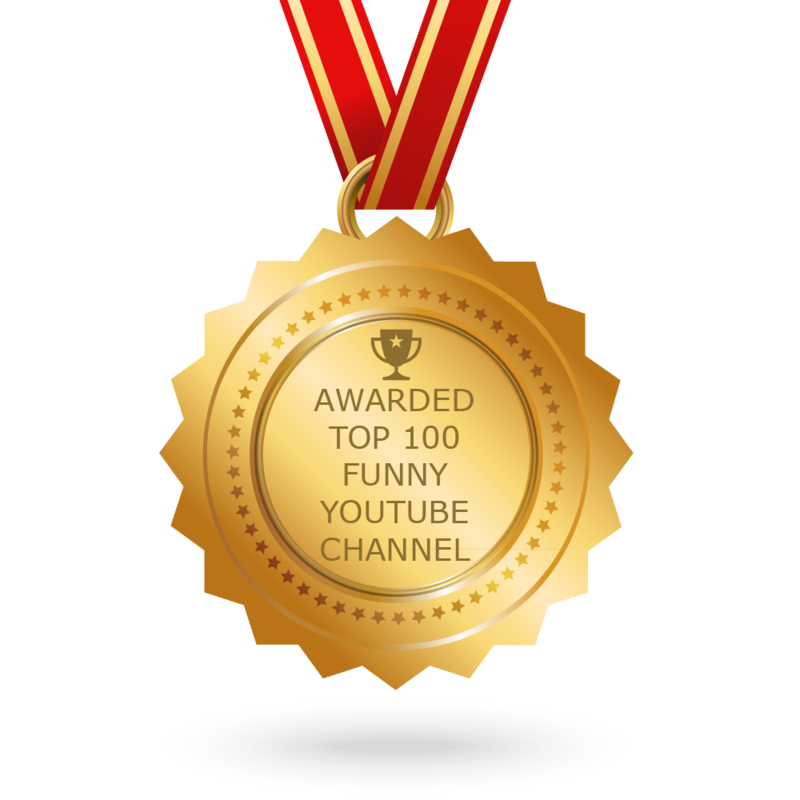 CONGRATULATIONS to every blogger that has made this Top Funny Youtube Channels list! This is the most comprehensive list of best Funny Youtube Channels on the internet and I’m honoured to have you as part of this! I personally give you a high-five and want to thank you for your contribution to this world.